Where my football fans at? LOL! My Dad is on deck in his chair and he’s parked in front of the television. He’s been looking a bit forlorn since the end of basketball season; making do with the occasional golf match. The pre-season games have begun and I tell you, he’s standing tall like a wilted flower that’s just been watered. I’m ready for some football – first because my Dad and brothers love it so much and second, because I love it so much. Few things provide prime bonding opportunities for a girl and her guy than televised or live sports. Not only that, sporting events and watch parties can present prime opportunities for Swirling. Let the games begin! 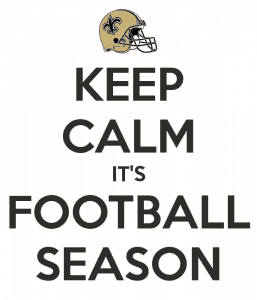 Geaux Saints! Join in the Fray: What’s your favorite sport and team? Sound off!